‘What’s in Season?’ is a new series where we’ll be sharing one recipe each week that uses one in-season ingredient. We’re starting with Radishes…Garlic Roasted Radishes, in fact. Last week I received my first Community Support Agriculture (CSA) basket of the year from Little Willow Gardens a beautiful garden located in a quaint, rural town known as Huntley, MN. We’re just getting into the prime of the garden growing season in Minnesota. 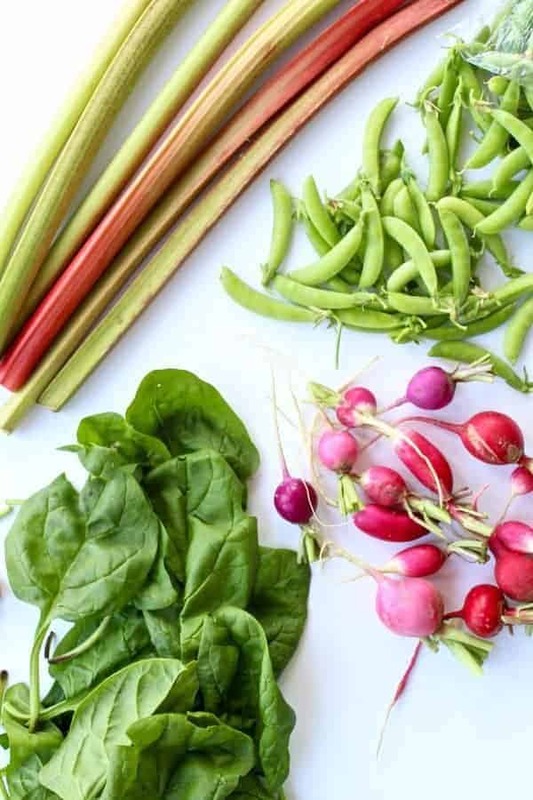 Tables at the Farmers Market’s are becoming more plentiful & full, backyard gardens are in full production and CSA baskets will continue to increase in veggie volume as weeks pass through the summer and early fall. I don’t know about you but I love this time of year because…..Hallelujah- bring on the veggies! The anticipation of finding out what’s in each weeks basket gets me all giddy which is what inspired me to create the ‘What’s in Season’ series. A way to share my excitement with you because we should all be excited about veggies 😉 Each week, I’ll be choosing one ingredient from the basket to feature on the blog (or Dietitian Jessica will feature one item from her garden). We’ll include a few quick facts and a delicious recipe for you to try. Our hope is that this series will inspire you to try new foods or try new ways to prepare foods and will also encourage you to support your local farmers and growers by hitting up your local Farmers’ Market! Mike and Amy of Little Willow Gardens and other local growers are at the Farmers Market in Blue Earth, MN on Saturdays from 9-12. Stop by and grab your weeks supply of in-season, local produce! What is a Community Supported Agriculture? CSA’s are a great way to support local farmers and to try new veggies. Read more about CSA’s here. Let’s take a look at what was included in Week #1’s basket. I enjoy trying new recipes as well as the challenge of creating recipes and finding new ways to prepare the fresh, in-season foods. For example, the other night I spent my time baking up a delicious Strawberry Rhubarb Pie with homemade crust. It was so.dang.tasty and had the perfect blend of sweet and tart! PS: I have a slight obsession with baking pies! But now let’s talk radishes! Are you ready? Garlic Roasted Radishes are my most favorite way to prepare radishes. If you haven’t tried roasting radishes, I recommend you give it a try – even if you don’t care for radishes, I think you’ll be pleasantly surprised. The garlic and butter (or ghee) adds such a nice flavor and roasting them settles down the peppery flavor and brings out their natural sweetness. Similar to roasted red potatoes but less starchy and much lower in carbs. Oh and get this, one time….I added radishes instead of potatoes in a beef stew and my ‘non-vegging loving’ husband didn’t even know….shhhhh! Radishes are a root vegetable that come in several different colors, and are a cousin to cabbage. Very good source of disease fighting and immune boosting vitamin C.
Contains antibacterial and antifungal properties. Contains a unique phytochemical called indoles which promotes detoxification. Contains powerful antioxidant/flavonoids that fight against cancer and aid in healthy liver & kidney function. 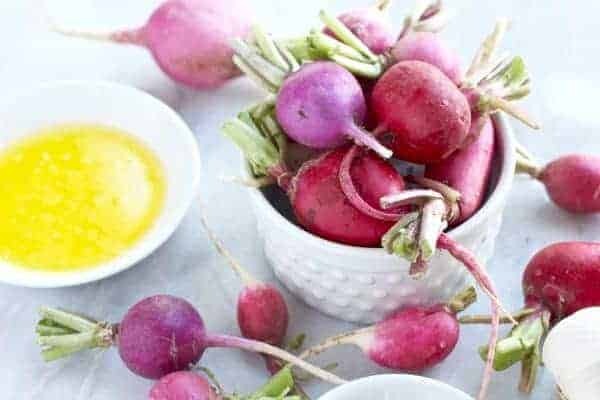 Learn more about the benefits of radishes here. In less than 5-ingredients you can make this unique and healthy side-dish. Simply toss the radishes with butter, garlic, salt and pepper and roast in the oven. I like the radishes best when they’re nice and golden brown. Enjoy Garlic Roasted Radishes as a side-dish or toss in a salad. Garlic Roasted Radishes will make for a light and tasty low-carb, side-dish to your favorite grilled meat. Another way to enjoy Garlic Roasted Radishes is by adding them to a salad along with sliced chicken, avocado, sliced almonds, green onions and tossed with a honey mustard vinaigrette. So good! You must give this recipe a try. And when you do, don’t forget to report back and let us know what you think! 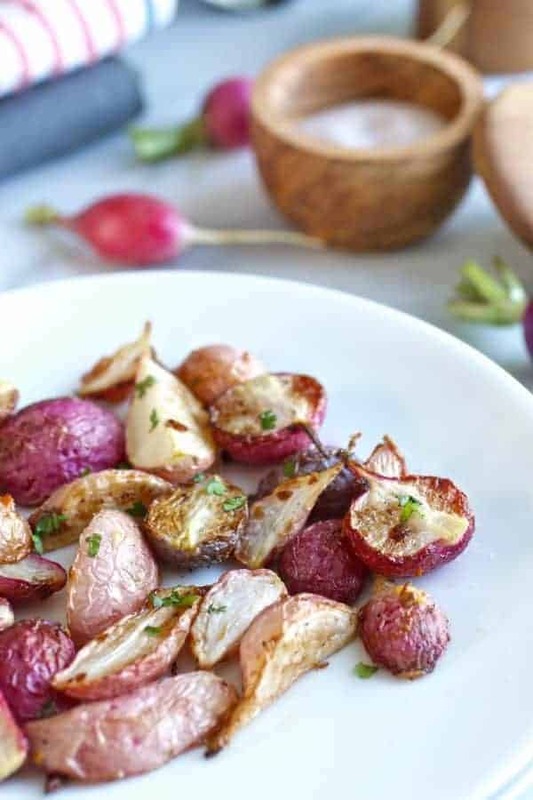 Garlic Roasted Radishes are a unique yet delicious way to prepare radishes. Roasting the radishes brings out their sweetness that’s otherwise masked be the peppery kick that they are known for. A must try recipe! 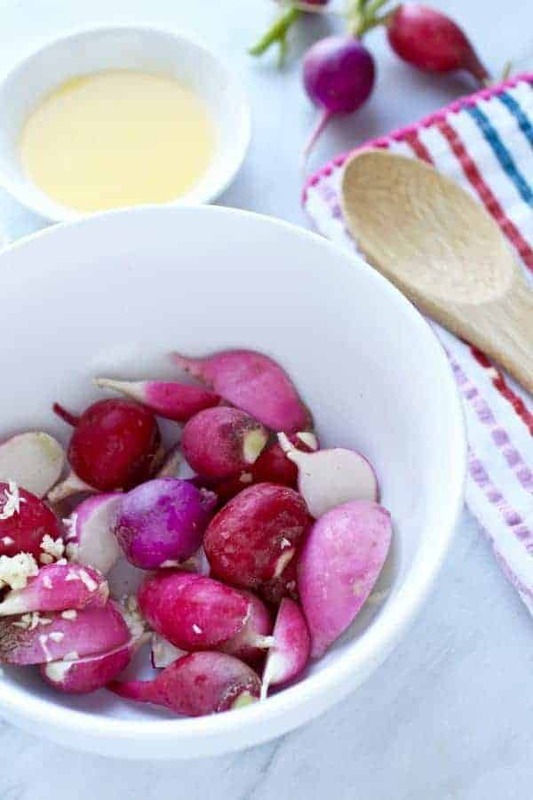 In a bowl combine the radishes, melted ghee or butter, salt and pepper and toss until radishes are evenly coated. Spread radishes out in a large 9×13 inch baking dish. Don’t over crowd. Bake for 20-25 minutes, tossing every 10 or so minutes. Add the minced garlic and dried parsley and bake for an additional 5 minutes or until radishes are golden brown and cooked through. Optional – Serve with a side of ranch for dipping or drizzling on top and garnish with parsley, dill or chives. All photos and content are copyright protected. Please do not use our photos without prior written permission. If you wish to republish this recipe, please rewrite the recipe in your own unique words and link back to the source recipe here on The Real Food Dietitians. Thank you!! Would love to hear, are you part of a CSA? If so, what’s your favorite part of being a member of a CSA? I had 3 bunches of radishes and 2 of baby turnips from our CSA to use up and this recipe is just delicious! Thank you so much! These were great! I added in some roughly chopped red onion that I had on hand too. I had to roast mine about 40 minutes to reach the tenderness I wanted. Worth the extra wait! That’s great! I love the addition of red onion, too. Hello! I manage a large CSA in Arroyo Grande, California. We grow lots of Purple Radish and I’m looking forward to trying your recipe and sharing it with our thousands of members. Thank you! Awesome! We can’t wait to hear how you like this recipe. Thanks for sharing! I tried this and was super excited but the radishes never cooked and had that roasted look that yours did. I had to cook them MUCH longer. Thoughts? Yea, tried roasted radishes last night, just simple salt an pepper with a bit of EVOO on them, used a sil-pat in a large baking sheet. They took 30 minutes at 450F, NOT 14-16 minutes at 400F, to get them to cooked/brown properly. I turned them at 15 minutes. Served them like potatoes, and put a low carb gravy over them that I made from the roast beef juice (hence the simple S&P seasonings). I don’t know why every roasted radish recipe I found said anywhere from 10 to 16 minutes @ 400F, because that just isn’t long enough. Natural convection versus forced convection oven maybe? I can see doing all different kinds of spices (thyme for chicken, onions, or even smoked paprika) depending on what it is being served with… Easy to do, great for any low carb diet. Thanks for this information. I’m guessing the time could vary depending on the ripeness of the radishes, the size and simply the oven. Next time I make this recipe I’ll be sure to pay extra close attention on the time. And yes, sooooo many serving and preparation options with roasted radishes! 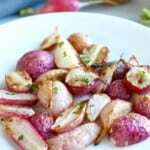 We really enjoyed this recipe of Garlic Roasted Radishes!. Thanks for post. I’m so glad to hear that! I personally love radishes and can’t wait for them to appear in the markets each spring. Would this work with grocery store radishes that are already trimmed and sold in a little bag? Maybe being previously refrigerated is why some have taken longer to cook? Yes, you can do these with trimmed and bagged radishes. It could be that the refrigerated ones take longer but the discrepancy in cooking time may also be due to the cooking temperature (because ‘medium’ or ‘medium-high’ won’t be the same from stove to stove due to differences in the burner size and BTU’s for gas ranges, etc.) It could also be due to the type of pan. Cast iron conducts heat more effectively than other metals, etc. I am a public employee and through work I was able to try a CSA this year. I have enjoyed trying new vegetables and learning how to cook new things. Things I might not normally buy. It has been fun to share with my neighbors too. This is great! Thank you for sharing, Vaughn. I think that’s one of the greatest benefits of a CSA – being introduced to try new things! So, maybe parsley pesto might work? As the finish. I was skeptical, as I am not a fan of radishes. I have been looking for more low carb sides and Omg! These were delicious. Thank you for the recipe. I did add a sprinkle of Rosemary. Glad you loved them – thanks for trying them! Why melted butter vs olive oil? You can use olive oil. We chose butter for the flavor. Dude I saw someone share this on FB and I was interested bc Ive been doing low carb. I’ve had thinly raw sliced radishes on avocado toast but I’ve never had much experience with this vegetable! I was delightfully surprised they were juicy tender and flavorful very similar to red potatoes!! 5 stars! This is so great to hear. Glad you gave it a try and enjoyed it.